The In Loving Memory windchime is a charming memorial tribute that will honor for years to come. The other-side of the Wind Sail can be engraved with up to 50 characters of your thoughts, feelings, names, and dates. The In Loving Memory® windchime is a charming memorial tribute that will honor for years to come. 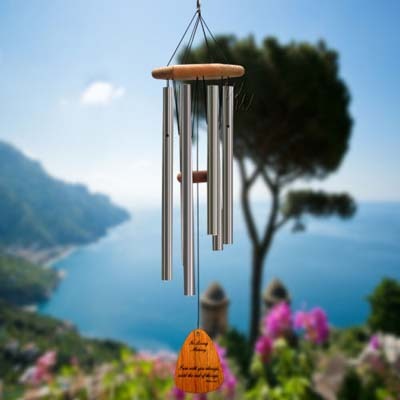 Made of American redwood, the chime features 6 anodized aluminum tubes hand-tuned to the scale of E. Each chime comes engraved with one of six inspirational verses. Made in the USA.